What mountains are you facing? This past year, I started doctoral studies, and the thought of researching, writing and defending a dissertation feels like a vast, unconquerable mountain. If I’m honest, sometimes being a pastor of church feels that way too. As does parenting or living out the way of Jesus in our complex world. How about you? Got any difficult situations in your life? Anything that seems impossible? Are you scared? Nervous? Struggling with anxiety or fear? With this wonderful message of assurance, and all the blessings in chapter 33, the very next book of the Bible, Joshua, begins nearly identically to how Deuteronomy concludes. Turn to Joshua 1:6-9, and what do we see? “Be strong and courageous”! Though this was a message for Joshua and the entire nation of Israel, there is a principle embedded in this for us too, when we face what seems impossible. How does this relate to us? Turn to Hebrews 13:1-6, and perhaps we’ll see the connection. In the first few verses, the writer of Hebrews mentions numerous actions, life choices that Christians are to follow. Then look at the surprising quote that the writer uses to sustain why we should follow God’s way. He quotes Deuteronomy 31:6, the very thing God said to Joshua! When a Christian is attempting to apply an Old Testament passage to their lives, it is always helpful when that very OT passage is quoted in the New Testament. What the writer of Hebrews accomplishes through his quote of Deuteronomy 31:6 is a powerful reminder to us that though there are many times in our lives that we Christians can be afraid, fearful or ashamed to follow the way of Christ, when we know God is faithful to us, we can have confidence that we can be faithful to him. We can be courageously obedient as disciples of Jesus, trusting in him, living out his way of living, because he has our back. Ours is a society that is changing, and it could be that living in obedience to Jesus will mean that we will look different from the people around us. We might even look strange. And yet, what is the promise we have from God? That he will never leave us or forsake us. We can be afraid or anxious or worrisome in life because there are so many difficult situations we encounter. But this principle reminds of us the rock we have in Jesus. While you and I might not be leading massive amounts of people to do huge world-shaping historical events, we each have important roles that God has called us to. We each face situations that might seem like they are too much. Digging out of a financial hole. Passing a test, graduating from high school. Facing a medical health emergency. Being a mom, being a dad. Life is fraught with so many difficulties. Do you feel stuck? Maybe you see some light breaking through the darkness, but there is a wall, a forest that seems like it is blocking the way. Maybe it feels like you will never get past the difficult situation you face. When we are in the middle of pain, we can wonder if God has locked our future, and we have no hope. But is that how God works? In this series of posts on Deuteronomy 31-34, we have been looking at Moses’ last words to the people of Israel, as he is about to pass on, and Joshua will be their new leader. Before Moses addresses the whole nation, first, in Deuteronomy 31:14-23, God has a private meeting with just Moses and Joshua, at the Tent of Meeting. There God appears in a pillar of cloud, and he has a very strange conversation with Moses and Joshua. It’s like God gives them a glimpse inside his heart. What we see is that God’s is a broken heart, broken because of Israel’s rebellion. Look at verses 16-18 in particular. It’s like God is opening a crack in the space-time continuum, and he allow Moses and Joshua to see the future. He says to them, “the people will break covenant with me. They will prostitute themselves to other false gods.” As a result, he says, he will leave them. God’s protection will be gone, and Israel will be destroyed. Woah. I have to ask, though: did they hear God’s words as an absolute future, as if it had no chance of changing? I don’t think so. Here’s why: Moses had been in this situation before. Remember the Golden Calf episode that happened not long after the people were originally freed from slavery in Egypt? They had been out of Egypt maybe a month and a half or so, and Moses had gone up on Mt. Sinai to meet with God, and there God gave him the stone tablets with the Ten Commandments. But what was happening at the same time down below? The people started getting antsy, feeling like Moses was gone too long, and they gave up. They created an idol in the shape of a golden calf and started worshiping it. God tells Moses, “You better get down there because the people are losing it.” Moses is angry with the people, of course, and he breaks the stone tablets, but God is angrier yet. He tells Moses that he is going to eliminate the people, and start over again with Moses. But what happens? Does Moses say, “Ok. Fine.” As if it was a set future, with no opportunity for a change? Nope. Moses puts on his lawyer hat (if there is such a thing…) and starts advocating on behalf of the people, and shockingly, God changes his mind. He is a gracious and loving God. So this vision of the future in Deuteronomy 31:18 is not set in stone, even though God is using words like “certainly” and “I will do this and that.” We know the forgiving, merciful heart of God because we have seen it time and time again. God is not given Moses and Joshua a picture of the unchangeable future. This is, however, another warning, a strong caution that the people need to obey God. To live a life of following God’s ways is far and away what is best for them, and thus we can see this passage as God loving them in the midst of warning. Next in verse 19, God tells Moses to get out a pen and paper and write down a song. This is a very rare occurrence in the Bible. God writes a song! In chapter 32, we will get to read the song. Before that happens, though, God has a word for Joshua, and it is the same command that Moses gave Joshua. Compare verses 7-8 with verse 23. See that is it nearly identical. As I said in part 2 we’ll come back to that. Before we get to God’s song in chapter 32, the final verses in chapter 31 talk about the Book of the Law. We read this in verse 9, and now again in verse 24, that Moses wrote down the Law, gave it to the Levites, who were the priestly tribe, and had them place it beside the Ark of the Covenant. But look at verse 26. That law, Moses says, is a witness against them, which sounds very negative, right? Then in verse 27-29, Moses pretty much says to the Levites what God had just said to him and Joshua, that Israel will rebel. Nice final words, Moses. He sure sounds bitter, mentioning how difficult the people were. Then he asks the Levites to assemble all the people together because he wants to address them, and give them a piece of his mind. When the people are together, we read in verse 30, that Moses recites the song to Israel, and we will find out what the song is all about next in part 4…and it is a strange song. Have you felt the sting of words that make you want to hide your face? Words have great power to wound, and power to heal. Last words are particularly meaningful and impactful. Maybe you’ve heard someone give their last words before death. More than likely you still remember them. What do you want your last words to be? Remember that Deuteronomy has been a last word of sorts from Moses to the people of Israel. They have been on a long journey, starting about 40 years prior. 40 years before this moment, 40 years before the events of Deuteronomy 31-34, the people of Israel were enslaved in Egypt, and it was as horrible slavery, a persecution, in which they had no hope. A prince of Egypt named Moses, though, came to them and revealed that he was actually a Hebrew like them. In a strange twist of events, he kills an Egyptian who was mistreating a Hebrew slave, flees into the desert, is away for awhile, and then returns from the desert saying that God had spoken to him and given him a mission to confront the Egyptian king, the Pharaoh, to let Israel go free. The story of Israel’s exodus or leaving from Egypt is one of high drama, involving astounding acts of God’s mighty power. But through it all, Moses emerges as an imperfect but effective leader of the people. They do leave Egypt and head out on a long journey to a new land. As they follow God to this Promised Land, both the people and Moses commit grave mistakes and have moments of astounding faithfulness along the way. Through it all Moses grows in stature and reputation. But now the time of Moses’ death is at hand. As I mentioned yesterday, this is our final blog series studying Deuteronomy, and it focuses on chapters 31-34. That’s a lot of material, I know, but as you follow post by post, I think you’ll see why I grouped it together. To get some context, my opinion is that it is best to start at the very end, Deuteronomy 34:10-12. There we learn the preeminence of Moses in the eyes of the people. He was a George Washington type in that he was a founder of the nation who led them through a difficult trial. But Moses was far more than Washington, as Moses spoke with God face to face. Did you notice how the writer of these verses describes the power of God that was resident in him? We also need to remember what was said of Moses in Numbers 12:3. He was a very humble man, the most humble on the earth. It is true that David was Israel’s greatest King, and David’s son Solomon was the wisest man who ever lived, leading Israel to heights of wealth and influence. But there is no one in the history of the nation of Israel that is as important as Moses. Not only did Moses lead the nation from slavery, but Moses was also the one to whom God gave the Law. Yes, Abraham, Isaac and Jacob, and Joseph, along with his brothers are the historical patriarchs of nation. Jacob was renamed Israel, which is where the nation got its name. The twelve tribes of Israel, therefore, are named after Jacobs 12 sons. But even those important factors pale in comparison the position that Moses has in the hearts and minds of the people. And now he is passing on. What we see, then, in chapters 31-33 are Moses’ actual last words. Sure, the whole book of Deuteronomy is Moses giving the people a retelling of the covenant. But here in chapters 31-33, we get his final words. Now turn back to the beginning of chapter 31. In verses 1-8 Moses tells the people that his time is up. Their invasion of the Promised Land of Canaan is about to begin in a short matter of time. But Moses will not be joining them. Instead he turns leadership over to Joshua. And he has some special words for the people and Joshua: He tells them that the Lord will be with them and will go before them, so they should be strong and courageous, they should not be afraid or discouraged. These are powerful last words that we will return to in future posts in this series. Next in verses 9-13, Moses one last time commands them to remain familiar with God’s Law. He tells them to make a practice every 7th year in which they come together as a nation to read the Law of God out loud, so that they, their children, and even the non-Israelites among them can remember to obey God. These last words of Moses are so encouraging thus far. But starting in chapter 31:14 and continuing most of the way through chapter 32:52, things get grim again. Remember the curses we studied in chapters 27-28? Chapters 29-30, the renewal of the covenant, also include strong cautions about disobedience. Once again, scan through chapters 31-32 and once again God is warning the people about disobedience. Are Moses’ last words going to be a smackdown? Check back in to part 3 to find out. I want to tell you about a dream I had this week. I’ve had a similar one before. Maybe you’ve had one like this too. My dream started as I was sitting in a chair at a pool party at a place I didn’t recognize. At the party were some of my kids’ friends and their parents. It was a fun event, like a birthday party. But as I looked around, I realized to my horror, that I didn’t have any clothes on. Instantly, I was super-embarrassed and used my hands to cover up, frantically looking for a towel. It was a moment of sheer terror. Ever had a dream like that? It is astounding what our brains and emotions can create in our minds when we are asleep. The images are so vivid. And often it is not hard to figure out why we had certain dreams. Our fear and anxiety comes out, right? So apparently, I’ve got some fear going on in my life. What am I afraid of? Well I’ll tell you. Since 2011 I have been an adjunct professor for Lancaster Bible College teaching online Bible courses. The course I have taught most often is a six-week intensive about how to study the Bible. During those six weeks my life can be crazy busy. Normally, I can swing it, but last fall I started doctoral studies, taking two classes of my own. So in November, right in the middle of teaching one of those six-week intensives, I said to my wife that it was too much, and after the new year I wanted to look into different options. My sister teaches online for Eastern University, so maybe they had something more suitable. Two weeks later, Messiah College contacted me out of the blue, asking me to teach a section of their intro Bible course. I couldn’t believe it. I hadn’t even thought of Messiah, though my two oldest sons are students there, and it was well before the New Year. The Bible department chair got my name from his colleagues who lead the Clergy Leadership Program of Central PA, of which I was a participant in 2015-17. One thing led to another, and I was hired. We started telling our older boys about it, and our second son, a sophomore, wrote back and said, “I think I’m in that class!” And sure enough he was! It was amazing how God answered my prayer far beyond what I expected or asked for. So I have started teaching for Messiah. And that is where the fear comes in. The Messiah class is not online, but in class. A few weeks ago it hit me, I’m going to have to stand in front of a class, including my son, and actually have something to say. Online classes had none of that. As of this writing, I have finished two weeks of the Messiah class, and I think it is going okay, but I can tell you that you I’ve had anxiety and fear about it! Additionally, this past week I was up at my seminary three days for my doctoral residency, and there, too, I can feel very intimidated surrounded by really smart and amazing people, all thinking about doctorates and dissertations. Put together, it can feel overwhelming. I’m almost certain that is what led to my embarrassing dream! In this final series of posts in our study through Deuteronomy we are going to meet someone who also faced what could easily seem like an insurmountable situation. A guy named Joshua. 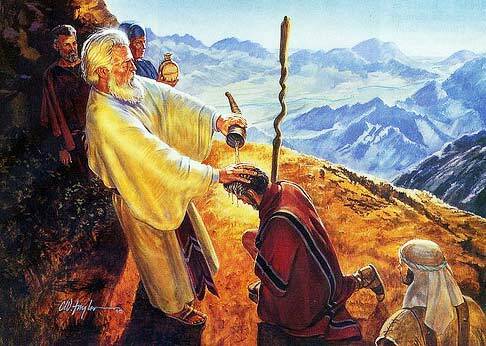 He was about to enter into the top leadership role in the nation of Israel, following in the giant footsteps of Moses. Have you ever experienced a transition of leadership where a long-time leader was concluding their time as leader, and a new person was stepping into that role? It may be a company you work for. It may be a volunteer organization. A church. A family. Might be in government. A Coach. Recently here in our school district we’ve had a couple long-time leaders move on. Some elementary school principals. Then the superintendent of the district retired two years ago. These transitions evoke all kinds of emotions don’t they? People miss the previous leader. People are afraid that the new leader will mess things up. Transitions are hard. They raise fear in us. Transitions can make it seem like the foundations are shaking. When there are pastoral transitions, some statisticians say, on average, 25% of the congregation will leave. Usually not all at once in some big exodus, but often gradually, over a few years. Why? We get scared, fearful. And you know what, the new leader is scared too. Fearful. And it comes out in our dreams, in bodily anxiety, panic. How do we deal with this? In Deuteronomy chapters 31-34 we’re going to learn about a leadership transition, and a bunch of people that could be fearful. Check back in for part 2 of the series! Today we’re talking about practice. At the time of the interview above, Allen Iverson was taking heat for skipping practice. We’re going to find that being committed to practice can save us from a whole bundle of trouble. Turn to Deuteronomy.26:16-19. This little section at the end of chapter 26 will transition us to the conclusion of Deuteronomy. From chapter 10, 11 and 12 all the way through chapter 26, Moses has been retelling the stipulations of the treaty or covenant that God had made with the people of Israel. Now here in 26:16-19 he adds a few words of review. In Verse 16, God commands Israel to follow the law with all their heart and soul. Next in Verse 17, Israel declares that YHWH is their God and they will obey him. Then in 18, YHWH declares that Israel is his people who will obey him. Finally, YHWH in verse 19 promises to honor Israel above all other nations, that they are holy to him. So in just a few short words, they have a summary of their agreement with one another. Israel will obey God as their only God, and God will honor Israel above all nations. But notice what is central to this entire treaty. Obedience. It is obedience with heart and soul. In this short section, look how many times obedience is mentioned. I count seven, one of which is the very last phrase: “you will be a people holy to the Lord your God.” That phrase doesn’t explicitly the word “obedience,” or even a synonym, but it is there alright because it is impossible for Israel to be holy without obedience. As we continue on, let’s keep this theme in mind: for Israel, obedience to God honors their relationship with him. Turning to chapter 27, we discover that the short review we just read at the end of chapter 26 was not the end of the matter. Not even close. Read Deuteronomy 27:1-8. What we see here is a description of a memorial altar that God wanted the people to build. These are what some call stones of remembrance on which they wrote the law. This is not the stone tablets on which were written the Ten Commandments. Those were stored in the Ark of the Covenant. These were to be memorial stones, a monument to help the people remember what is true. In my family, my wife Michelle has stones of remembrance in our house.They are coffee mugs, each from a place we have visited. We need these reminders, as they help us remember the blessing of our travels. Do you have stones of remembrance? For ancient Israel, these monuments were designed to help them remember the covenant they made with God. Christians often display crosses to help us remember our relationship with Jesus. Sometimes on necklaces. Often on the walls of our homes and churches. Some churches are built the shape of a cross. These are monuments, big and small, to help us remember what Jesus did for us. By amazing love, through his sacrifice, we can have forgiveness and hope and a home with God. Furthermore, the cross reminds us that we are to live like Jesus, what some would call a cruciform, or cross-shaped life. Christians are called to follow the way of Jesus. In the midst of our busy lives, in the midst of the pressure from our culture to be consumers, to pursue entertainment, we can forget the mission of God’s Kingdom. We can forget our calling. Sometimes stones of remembrance can help remind us of what is true, and thus we can reorient our lives around the truth. I often think that life is a nonstop series of reorientation. Because we so quickly forget. What have you forgotten that you need to remember? Do you need to look again at your stones of remembrance? When I drink coffee in the morning from our mugs, I rarely think about the place names on them. I just want to drink coffee! I could make a practice of looking at the place name, thinking about our time there and praising God for all we experienced and learned. Do you have a practice of stones of remembrance? While this law is not our law, we can see the wisdom in it. You might want to start a practice of remembrance. I love the practice that comes next. Look at Deuteronomy 27:9. Moses and the priests tell all the people to be silent and listen. This is another excellent practice to consider adding to our lives. Again, it is not our law, but it is something that we would do well to add to our relationship with God. In a relationship with someone, it is vital that we spend time listening to them. If we don’t listen to them, our relationship with them will be likely be over pretty fast, or if it isn’t over, it will be miserable. Likewise, we need to listen to God. That means we need to take time and be silent. Turn off the radio, the TV, the music. Turn off the noise, and listen for God to speak. In Israel’s case, they were to listen to two truths. One at the end of verse 9, and one in verse 10. In verse 9 they are to be silent and listen to the truth about their identity. They are the people of the Lord their God. They are not slaves in Egypt. They are not a wandering people with no nation. They are not weak. They are not small. There are numerous descriptions that they could be tempted to give themselves. But the one truth about their identity is that they are the people of God. They are in a special relationship with God. It is a personal relationship with God. God loves them. That is their identity. What is the truth about your identity? We Christians, we disciples of Jesus, are loved children of God. We need to be silent and listen to the truth of our identity. We are not failures, we are not misfits, we are not pathetic, we ARE dearly loved children of God. My suspicion is that most of us, me included, do not take enough time to be silent and hear that truth from God. That is the first truth they are to listen to. The second truth is found in verse 10. It is a repetition of what we have heard already in chapter 26:16-19: they are to obey God and follow his commands. No surprise there. But then the passage takes a turn, a turn that is very much connected to the idea of obedience. In verses 11-14 Moses tells the people that after they cross the Jordan River they are to gather together, the whole nation. Remember that the entire book of Deuteronomy is Moses giving the people a second telling of the law before they take full possession of the Promised Land of Canaan. They have just barely entered the eastern side of the Promised Land, had some battles, and set up camp. The next step is the large scale invasion of the land on the western side of the Jordan River. If you jump ahead into the next book of the Bible, the book of Joshua, you can read the story of this invasion. For now, Moses is saying to them, when you do start the invasion, you will eventually come to two mountains facing each other. Mount Ebal and Mount Gerizim. Six of the tribes, or half the nation, is to face Mount Ebal, and the other six tribes are to face Mount Gerizim. In this ceremony, the one tribe, the Levites, the priestly tribe, was then to read a group of curses and a group of blessings. But what were these Curses that they were saying “Amen” about? What kind of curse are we talking about here? There are many ways to use the word curse. Swear words or bad words comes to mind, but hat’s not the cursing here. Or is this like a Satanic curse, like witchcraft or sorcery? Is God putting an evil curse on people? Imagine a wizard with a wand, shooting out a magic power that binds up a person, like Sleeping Beauty cursed into a sleep that never ended until she was kissed by the prince. Or like the man who was cursed to be in the form of a beast until the beauty truly loved him. Is that the kind of curse God is doing? Or is these curses in Deuteronomy 27 maybe referring to consequences or punishment? The verb itself is translated “to bind with a curse,” but what does that mean? Is all hope lost for this person? Can the curse be broken? One author I read said that word “curse” means the person who commits the offense is “destined for divinely imposed disaster.” So while the person is not zapped by a magic wand, they clearly don’t want to be in a position where they are destined for divinely imposed disaster. Take note of the curses, and what God says can get Israel in a position of being cursed. In verse 15, it is idolatry. In verse 16, dishonoring your parents. In verse 17-19, three kinds of injustice. In verses 20-23, four kinds of sexual impurity. In 24-25 murder and bribery. Finally in 26, a concluding summary curse for not obeying the Law. Then all the people cry out together, “Amen” affirming that they agree and they bind themselves to this covenant. So the curses are life choices that result in divinely imposed disaster. That leads us to the Blessing section, Deuteronomy 28:1-14. These blessings are amazing! Every part of Israel will be blessed. God promises that if Israel is obedient he will honor them and lift them high and make everything go wonderful for them. He will open the heavens, the storehouse of his bounty, for them. Wow! You almost feel a little embarrassed, or even guilty because Israel will be so blessed. It reminds me of my daughter’s soccer games a few weeks ago when they were beating the other team so bad, the staff stopped keeping the score on the scoreboard. When my daughter scored a goal I wanted to cheer for her, but the score was already something like 17-0, and we didn’t want to make the other team or their spectators feel bad, so I had to do a quiet cheer. The collection of poems that we call Psalms starts with Psalm 1, a wisdom psalm that talks about these blessings and curses, and it points to another practice. Basically the psalm says that if we follow the way of wickedness we will be cursed, but if we meditate on God’s Word and do what it says, we will be blessed. We need to be a people, therefore, who practice meditation on his Word. This meditation is more than reading. It is instead a deep thinking upon, a desire to understand and apply God’s teaching to our lives, and then to live them out. Initially as I studied the blessings and curses in Deuteronomy 27 & 28, I thought, “I love that he focuses on blessing second. In other words, God finishes with a vision of how good things can be!! !” But then in chapter 28, verse 15 arrives, and, surprise, we’re back at the curses. Scan from verse 15 to the end of the chapter. What do you notice? It is a long chapter. He goes on and on and on about how awful it will be for Israel if they do not obey God. Did God get stuck a rut of curses? We’ve already had curses back in chapter 27. But now in chapter 28 there’s an explosion of curses. Start with verses 15-19. You’d think these four additional curses, along with what we already read in chapter 27 would give the people the idea that God really wanted them to obey, and if they didn’t obey, they were in big trouble. But that’s just the tip of the iceberg. The picture God paints starting in verse 20 and continuing all the way to verse 68 is off the charts. Look at verse Deuteronomy 28:26 for example. There God is telling Israel what will happen if they disobey him and then try to go to battle. Read verses 26-29 and you’ll see what I mean. It’s so bad it’s almost humorous. I am not making light of it as this is serious stuff. But my goodness, does it ever stop? It gets disgusting and vile at some points. Seriously. And why? I think the point of it all is actually to totally revile the people. If this was depicted on a video, most of us would have to turn our heads. God is saying to Israel that if they disobey him, they will face utter and total ruin in every facet of their lives: nationally, individually, emotionally, physically, intellectually, and spiritually. He covers it all. Right in the middle of this passage, though, God shares his purpose for this horrible news. Look at verses 45-47. God wants Israel to be clear, abundantly, excruciatingly clear, of what is at stake here. They are his people, and he is their God, and they will have such wonderful blessing if they obey him. But if they don’t, it will be so, so bad for them. The curses and the devastation that will erupt on them because of their disobedience will be a sign, for them and their descendants, not that God is brutal, but that Israel was unfaithful. Look especially at verse 47 which gives us another practice. “Because you did not serve the Lord your God joyfully and gladly in the time of prosperity.” God envisions for them the time of blessing in the Promised Land, and is saying that the time of blessing is when they should serve God joyfully and gladly. That is a great message for us. I know life in these United States has its really difficult aspects. But we also have much blessing. In the midst of blessing, we too must serve God joyfully and with gladness. Yet how easy it is to complain and get fussy. I recently heard of a church that created a no complaining rule. How about your church? Will you ban all complaining? In Philippians 2:14-16, Paul says that we should do everything without grumbling and complaining because we hold out the word of life to the world around us. Who in your community would want to be part of God’s Kingdom if the your church is known for being complaining and fussy? Instead, let us serve God joyfully and gladly! Even when life gets tough, even when people tick us off. Let’s be joyful in our obedience to God. Sadly, Israel would totally throw their relationship with God in the trash. They disobeyed so many times, and God allowed the consequences of their disobedience to fully impact them. This happened periodically in the nation in small ways throughout their history, but the disobedience got so bad at that eventually, he allowed them to be defeated by foreign enemies and re-enslaved in those foreign lands. Israel felt the divinely imposed disaster of the curse. Look at Deuteronomy 28:68. That’s re-enslavement happened to Israel. What we see, then, is that there is a side to this covenant that is conditional. It is an If-Then statement. If you obey, then you will be blessed. If you disobey, then you will be cursed, and we see that throughout these chapters. But there is also a side of the covenant that is unconditional. Fast-forward with me through the centuries. As I mentioned, Israel disobeyed and God allowed them to be captured and re-enslaved. But God is faithful and forgiving. Amazingly so. One of Israel’s prophets, Zephaniah, depicts this. In Zephaniah 3, God, after all that pain of Israel’s unfaithfulness and exile, comes back to them with a vision of grace and blessing for Israel. Amazing, God’s faithfulness to Israel! But how does this connect with the New Testament? We are not Israel, and we are not under this covenant. So first we must ask, what did this mean to them? God faithfully loved and provided for Israel, he rescued them from slavery and set them on a path of freedom, gave them a land of their own, and promised to bless them if they obeyed. Next we seek the underlying principle: When we obey God, we are following the best possible way to live. This is not a promise of a perfect life, as if there will be no trials and struggles and difficulties for those who obey God. Sometimes following God will make life harder. Think of those Christians around the world who are persecuted for following Jesus. Think of the fact that following God means he asks us to practice self-control that we sometimes don’t want to use. God calls us to restrain our lusts and desires, and not just indulge them, and that can be hard. Clearly, God’s desires in all these blessings and curses is that he wants his people to experience blessing and he wants them to avoid curses! He wants his people to have the best life possible. So there is a sense in which he wants to entice them with a glorious vision of the blessed life, and he wants to caution them with a vision of the pain of the cursed life. God wants to protect his people. Finally how can we Christians apply this to our lives? Obedience starts with choosing to trust in and follow the way of Jesus. His grace has forgiven all our sin. But we don’t abuse his grace. Instead we choose to obey. In another place Jesus also says, “my yoke is easy and my burden is light.” Following the way of Jesus takes practice. Self discipline. One of my children is taking guitar class at school, and it is hard when you are first starting out to make your fingers work the strings. In guitar class he is not saying “this yoke is easy and burden light.” But ask me about how he uses the controller for his Xbox video games. He has practiced that a lot, and his fingers fly over the controls with ease. We can and should live a well-practiced life. Practices or habits help us follow the way of Jesus. They help us obey and live the life he desires for us. God wants there to be supreme courts and presidents. Really? Well, kind of. In this series, we are studying Deuteronomy 17, seeking God’s heart for good government, and we move from what God instructed Israel to do with local governance to what he wanted for their national governance: supreme courts and presidents! In Deut. 17:8-20, he describes a unique system in which priests and a judge form a national-level law court with the responsibility of providing rulings on the most difficult cases (bloodshed, law suits, and assaults are the three examples given), cases that the lower courts were unable to decide. It seems this high court, located in the city of God’s choosing, was to be like our supreme court. What do you think of the fact that this high court was to be comprised mostly of priests? In verse 12 we read about “the priest there ministering to the Lord,” which might be a reference to the high priest of the land. So this high court had heavy hitters. The judge of the land, and maybe the high priest, and then perhaps also an unnamed number of other judges. What that means is that Israel’s high court includes both the civil and religious leaders. To our American ears, it might sound odd when we read that Israel was to have priests on its high court. Can you imagine if our Supreme Court included religious leaders? But for Israel it makes sense, because the priests were the ones who knew the Law the best. We see this in verse 10 where God says they were to decide these hard cases, and in verse 11, as they were to teach people the law. Then the people were to absolutely follow the decision of the court. No wavering. Look at the penalty for those who disobeyed! Verses 12-13 say it is the death penalty. In our view this might seem insane. As I’ve mentioned in previous posts in our study of Deuteronomy, I’m glad we Christians are under a new covenant. We also need to remember that it wasn’t some random law that Israel was following. Whose law governed their land? God’s law. The priests and judges were not making up new laws and asking the people to follow them. They were simply deciding cases, based on God’s law. Their government was a theocracy, meaning God was at the top, God was ruler. When people disobeyed what this high court decided, they were disobeying God. That’s bold disobedience, and it was to be taken seriously. Again, I am so glad the church is not under this covenant. So far in this series we have seen God’s desire for Israel to have local courts, and a high court, and now we have one higher level to go: the King, which is described in Deuteronomy 17:14-20. This section envisions a time in the future when Israel is settled in the land and wants a king, “like all the nations around” them. Warning. Warning! Warning. We should be seeing warning signs in this verse. What warning sign? That phrase “like all the nations around us.” What is wrong with that? Israel was NOT to be like the nations around them. We have seen that in previous posts. They were not to worship in the detestable ways of the nations around them. And here is the kicker. They shouldn’t be asking for a king because they already had a king! Who was their king? YHWH, God was their king. This section is just a few verses long, but it points to something that is going to have significant consequences for the nation. God knows this. Let’s just jump ahead into the future and see what happens. We’re traveling to a time about a couple hundred years after Deuteronomy 16. The book of Joshua comes right after Deuteronomy and tells the story of the conquest of the Promised Land, led by Joshua who took over for Moses. The people settle down, and after Joshua dies, we read in next book, the book of Judges, that there are a series of judges who become the top leader of the nation. One of those judges was a guy named Gideon who won an amazing battle, and the people wanted to make him king. In Judges 8:23 we read that Gideon was not a fan of that idea and instead responded, “the Lord will rule over you.” That’s right, Gideon! The people had a strong desire to have a king like the nations around them. Gideon might have tamped down that desire for the time being, but it would return. Then maybe another hundred years or so after Gideon, in the days of the very last judge who would rule over Israel, a guy named Samuel, the people were again asking for a king. I encourage you to read 1 Sam. 8:4-9. Did you hear how God felt about this idea? He felt rejected! Israel doesn’t need a king because they have God, the one true king. The same goes for us, as we Christians worship God alone, and and we do not worship human leaders. In the next post, we’ll turn back to Deuteronomy 17, and what we’ll see is that God knows the people will ask for a king, so perhaps he can set some laws in place to help this king idea turnout different from the nations around them. What God will say about the king is shocking.